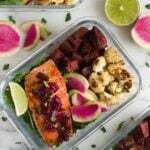 The prettiest meal prep ever! 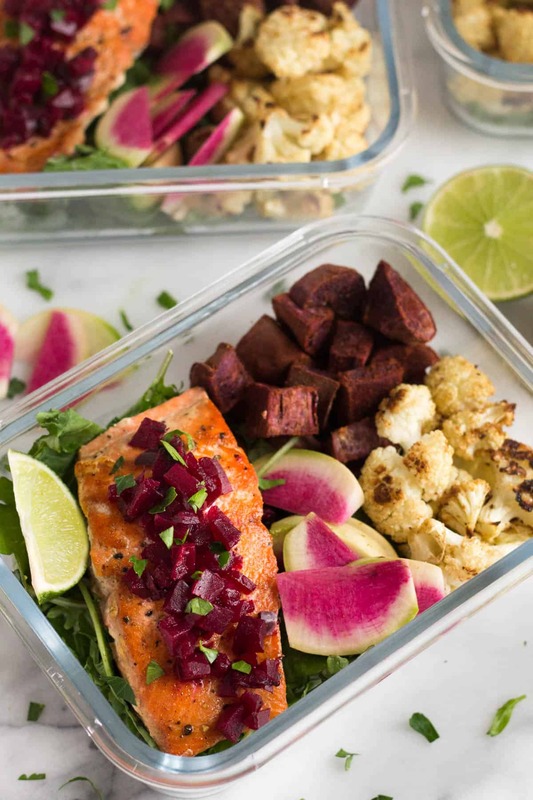 35 minutes for this easy & healthy Meal Prep Salmon and Veggies Bowls – packed with protein, veggies, and some healthy fats to keep you going throughout your day for an easy work week lunch or quick dinner. 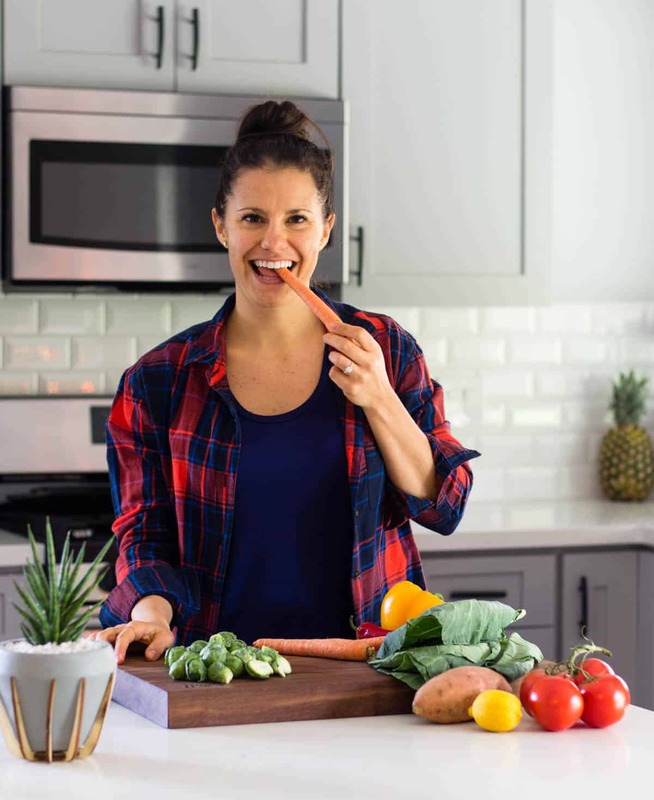 Gluten free, dairy free, paleo, and Whole30 approved. This recipe first appeared on Instagram in partnership with Love Beets. The prettiest meal prep bowls I ever did see!! ??? Eating pretty food just makes me happy. Who doesn’t look a plate that is not only tasty, but pretty to look at as well?! I love when food is beautifully plated at a restaurant. It just makes the experience that much more fun. While I’m not on that level yet, I’m working on it haha ? You guys know I’m a huge fan of meal prep. I mean I do it for a living so I must enjoy it. 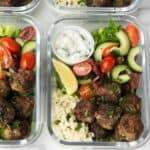 When I asked you earlier this year what kind of recipes you wanted to see, a lot of you said meal prep recipes. 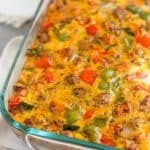 While most of my recipes are great for meal prep, I’ve been trying to make some more meal prep specific posts. I already brought you chicken burrito bowls, greek lamb meatball bowls, and now we have these salmon and veggies bowls. For some reason I think people get a little intimated by meal prepping seafood. I’m not sure if it’s the idea of the fish going bad or what, but seafood is a great option to meal prep. You can’t be as lenient with letting it sit in the fridge as long, but it keeps great in glass containers. I love these glass meal prep ones I found on Amazon. Or maybe you just don’t know how to reheat it. The salmon can be slightly undercooked in this recipe if you are going to reheat it – pop it in the microwave for 1:30-2 minutes to easily reheat. If you are going to eat it cold (which I love doing), then feel free to cook it all the way through. One of the keys to meal prepping and saving time is multitasking. You can make this meal in under 30 minutes if you multitask! The idea is to do multiple things at once – while the sweet potatoes and cauliflower roast, start prepping the bowls with greens. And then when the veggies are almost done, make the salmon. Everything should be done around the same time and then all you have to do is assemble. 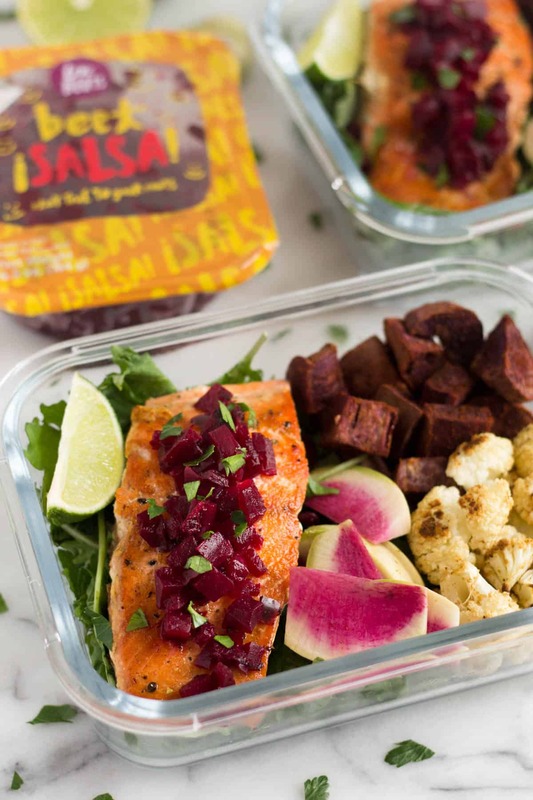 These salmon and veggies bowls make the perfect workweek lunch. 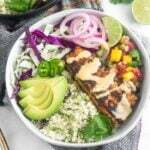 They are packed with protein and heathy fats from the salmon, carbohydrates from the sweet potatoes and beets, and veggies with the greens, cauliflower, and radishes. 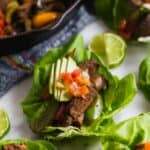 Serve with a lime wedge and you have a well balanced dish. 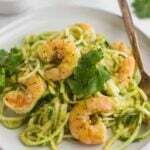 These can also be made for dinner if meal prep isn’t your thing! 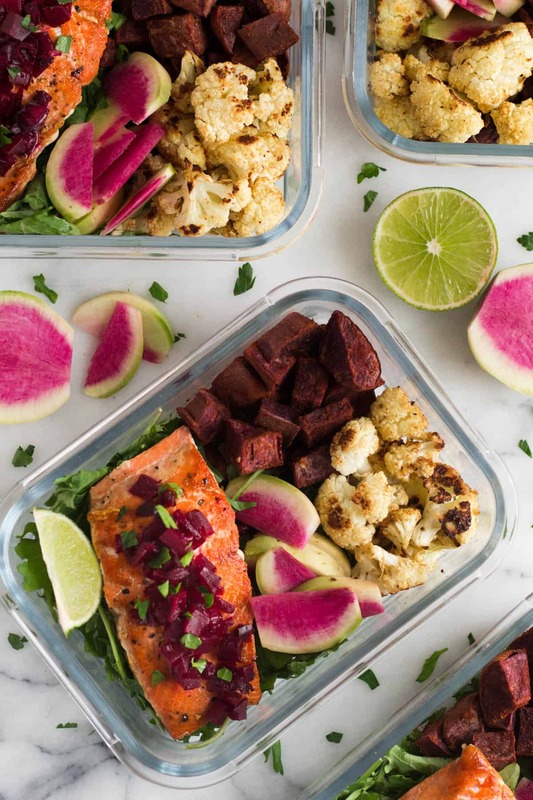 The prettiest meal prep ever! 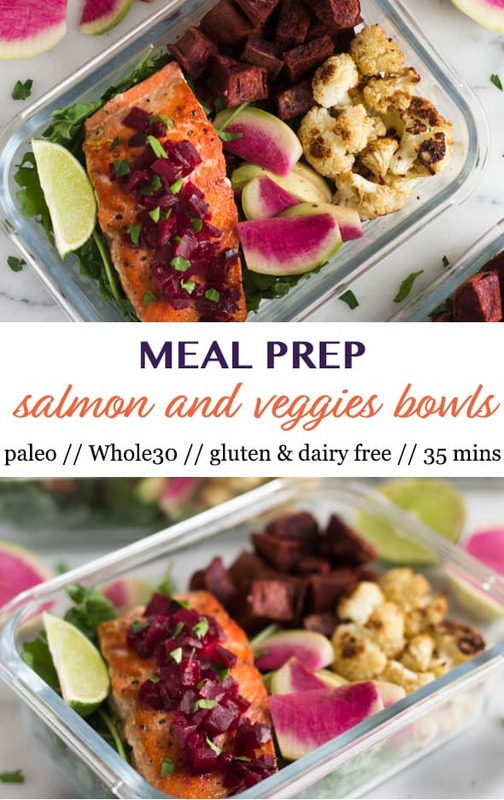 35 minutes for this easy & healthy Meal Prep Salmon and Veggies Bowls - packed with protein, veggies, and some healthy fats to keep you going throughout your day for an easy work week lunch or quick dinner. Gluten free, dairy free, paleo, and Whole30 approved. Preheat oven to 400 degrees Fahrenheit. Toss cauliflower with 1/2 tablespoon avocado oil, garlic, ginger, and mix to combine. Spread out evenly on a parchment lined baking sheet. Toss sweet potatoes with 1/2 tablespoon avocado oil, cumin, and paprika and mix to combine. Spread out evenly on another parchment lined baking sheet. Place baking sheets in oven and roast for 30 mins, stirring halfway. Once veggies have 6-8 minutes left, make the salmon. Head a large non stick sauté pan over medium heat and add 1 tablespoon avocado oil and let it get hot. Sprinkle salmon with salt and pepper and place filets flesh side down (skin up) in hot oil and do not move. After one minute, add coconut aminos and pick up pan to move it around some. Cook for 1 more minute and then flip skin side down. Cook for 3-5 more minutes depending on thickness until cooked to your preferred doneness. 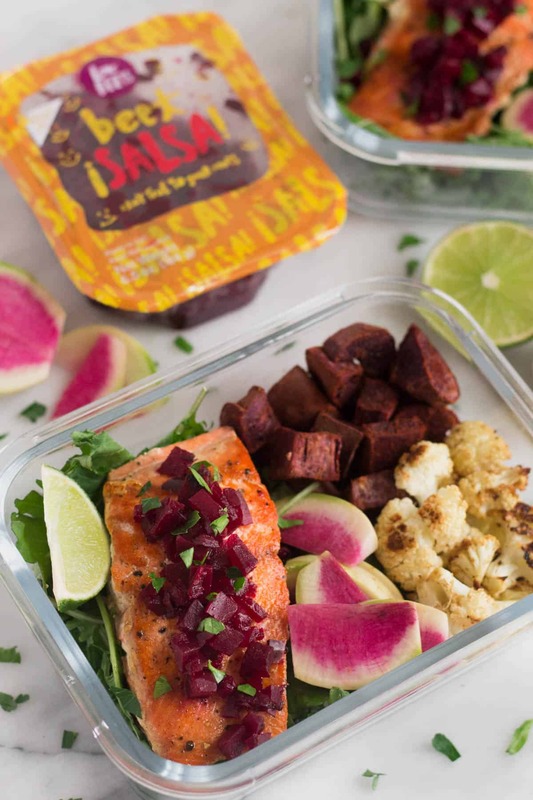 Make the bowls - divided kale, sweet potatoes, cauliflower, radishes, and salmon between 4 bowls. 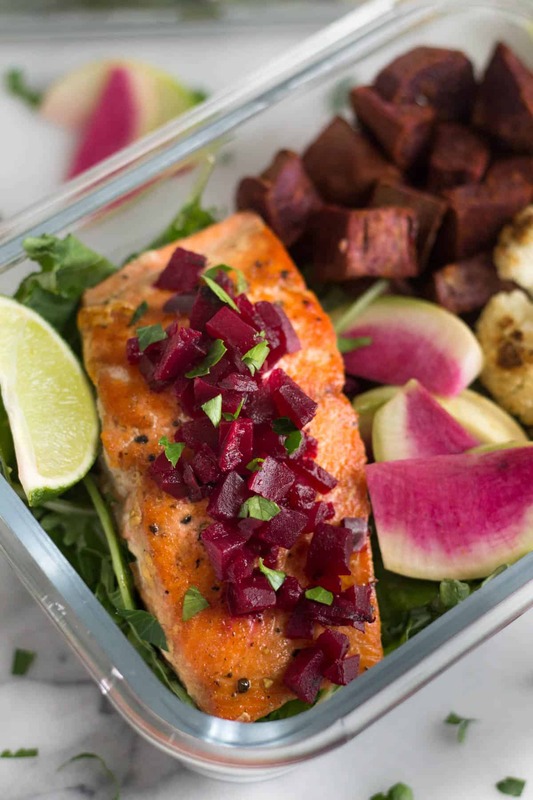 Top each piece of salmon with 2 tablespoons chopped beets. Top with fresh parsley and serve with a lime wedge. Enjoy!